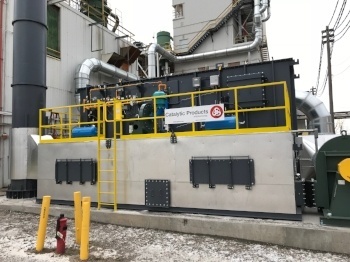 May 31, 2018 - "Press Releases"
Catalytic Products International (CPI) recently completed the installation of a TRITON Series Regenerative Thermal Oxidizer (RTO) at a Canadian based phenolic resin and solid molding compound manufacturer for the abatement of Volatile Organic Compounds (VOCs). A 15,000 SCFM TRITON-15.95 Regenerative Thermal Oxidizer (RTO) was installed to control VOC emissions from the discharge side of two separate baghouses associated with the process manufacturing lines. The Regenerative Thermal Oxidizer (RTO) will reduce the concentration of phenol and other VOCs to 98% at a thermal rate efficiency (TRE) of 95%. Thermal treatment of VOCs and other air pollutants works by a simple reaction of the harmful air pollutants with oxygen and heat. In this environment, the VOCs are converted into harmless inert byproducts, water vapor (H2O), and usable heat. These harmless by-products are typically released to the atmosphere, or in some cases use an energy recovery technique to further lower the operational costs. The TRITON Series Regenerative Thermal Oxidizer (RTO) is a two-tower system engineered to provide exceptional performance and reliability. During operation of the RTO the VOCs are ducted into one of the system’s regenerators, an internally insulated vessel containing specialized ceramic media which allows thermal rate efficiencies up to 97%. The contaminated gases are passed through the first regenerator where energy is transferred from the ceramic media to the gases in order to elevate the temperature of the gases. After reaching this elevated temperature which approaches the ignition level for most solvents, the gases are directed to the internally lined combustion chamber. In the combustion chamber minimal heat is added to ensure a proper oxidation temperature as well as a designed dwell time and turbulence to provide destruction of the VOCS at greater than 98% efficiency. The resultant clean, oxidized gases are redirected into the second regenerator bed to continue the energy transfer and oxidation cycle before being released to the atmosphere. CPI provided a complete turnkey project, including design, supply and installation of the Regenerative Thermal Oxidizer (RTO) on a customer supplied concrete foundation. CPI was able to complete a good portion of the installation activities before the new unit arrived on site and delivered the TRITON-15.95 RTO fully shop assembled and skid mounted with the media installed. Galvanized spiral ducting was installed to connect the existing baghouse exhaust blower discharges to bypass T-damper assemblies and to the RTO. Installation also included a two stage prefilter to remove any process particulate not controlled by the baghouses, electrical work, natural gas supply, and compressed air piping. CPI worked closely with the customer and third party contractors to minimize the downtime associated with the installation of the Regenerative Thermal Oxidizer (RTO). CPI also provided on-site supervision to ensure coordination to guarantee that entire system was installed correctly, and the facility was back up and producing product with minimal downtime. Since 1969 CPI has been providing companies including the thermoset resin industry with solutions to their air pollution control needs. To learn more, visit our website at www.cpilink.com.